Quite awhile ago, I shared a few words that spark vivid memories for me whenever I hear them. Today I wanted to add to the list. These aren't necessarily words that have special meaning or that I absolutely love (although both may be the case). My only criterion is that the word has to conjure up a specific memory. I can't hear this word without thinking about my childhood friend, Kathy Hall. My mom taught piano lessons to her, and most weeks, she stayed and played with me after her lesson. Those were the days when I was obsessed with Playmobil, and Kathy and I had ongoing sagas . . . always to be continued the following week. I'll never forget the afternoon when everything in our game was "pathetic." Kathy must have learned that word right before her piano lesson that day because she used it over and over again. The thing is, I think she thought "pathetic" was synonymous with "annoying," and pretty soon her use of it was pathetic . . . I mean, annoying. One of my favorite books (and movies) is Anne of Green Gables, and "providential" will always be a word that I closely associate with it. In fact, I have a difficult time using it myself with any degree of seriousness because I always sound like Mrs. Spencer: "I call it positively providential!" I love it though because it always reminds me of how much I love Anne and her stories. 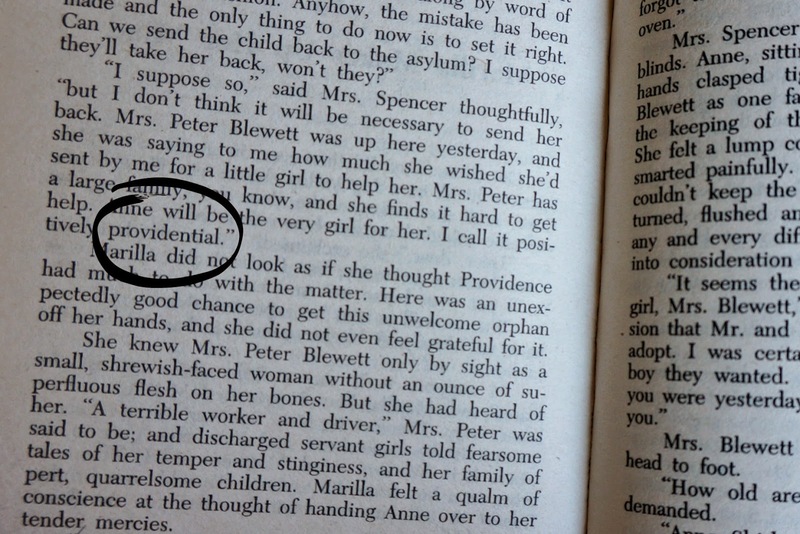 Speaking of words in books, this one was used a ton in Edenbrooke. Anytime Marianne was annoyed with Philip, he was "odious." I loved that book, but I don't know if I've ever been so sick of a word in all my life. The word "odious" became odious, if you will. I didn't know this word at all before reading Flora & Ulysses last year. (What does it say about my vocabulary if I'm learning new words from children's books?). However, aside from having trouble pronouncing it (I was reading it aloud), I didn't give it much thought. 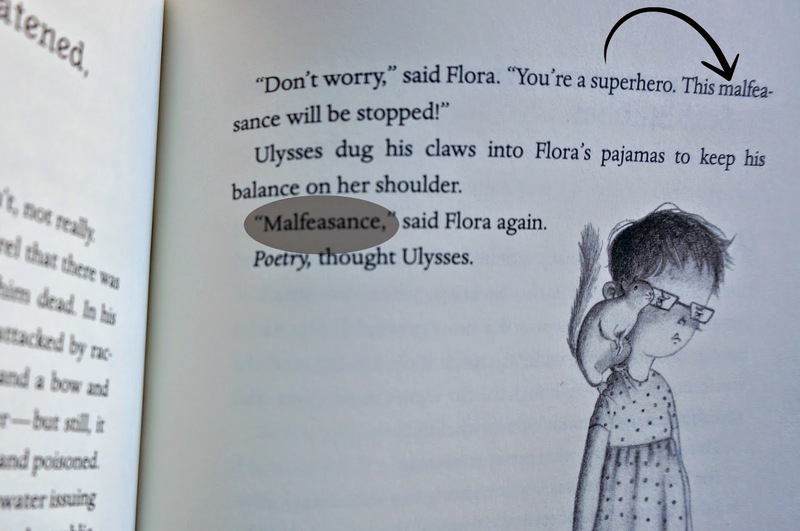 But then, a few months later, I was reading All Joy and No Fun, and all of a sudden, there was the word "malfeasance," and I had an instant flashback to Flora & Ulysses. That's how you know that a word has made an impression on you--when, unbidden, it transports you back to a specific place. This is actually not my flashback, but Aaron's. Last year while reading Ramona the Pest, we came across the word "pitiful." Aaron said, "Hey, that's just like in Runaway Ralph!" And it was true; "Pitiful" had been used then to make a similar description. We had maybe even talked about what it meant, which is probably why he remembered it when we came across it again. Either way, I loved seeing him make that connection between books. This one is totally random. I've always loved to write, and when I was probably nine or ten, I was on a quest to use new words in my writing. One day I stumbled on "latter," and for days afterwards I looked for opportunities to use it in a story or journal entry. It must have been a hard one to naturally incorporate because it has stuck with me for twenty years. I just think it's funny because I don't find "latter" an especially pretty word, nor does it mean something really unique or interesting, but for some reason I liked it. What words give you a flashback?